Chile’s temperate rainforest, where Lobelia bridgesii grows, has been identified as one of the world’s key biodiversity hotspots by Conservation International, known as the “Chilean Winter Rainfall – Valdivian Forests”. In 1991, the Royal Botanic Garden, Edinburgh, Scotland initiated the International Conifer Conservation Program to inventory, research, and establish protected sites for the world’s conifers, with one of its focal points being the Chilean rainforest. Rain forest trees of all kinds are being removed from the Valdivian forest for construction lumber and industrial and home fuel, both for domestic use and for export to countries as far-flung as Japan and North America. Plantations of non-native pine and eucalyptus trees are changing groundwater and soil composition, and affecting surrounding areas. 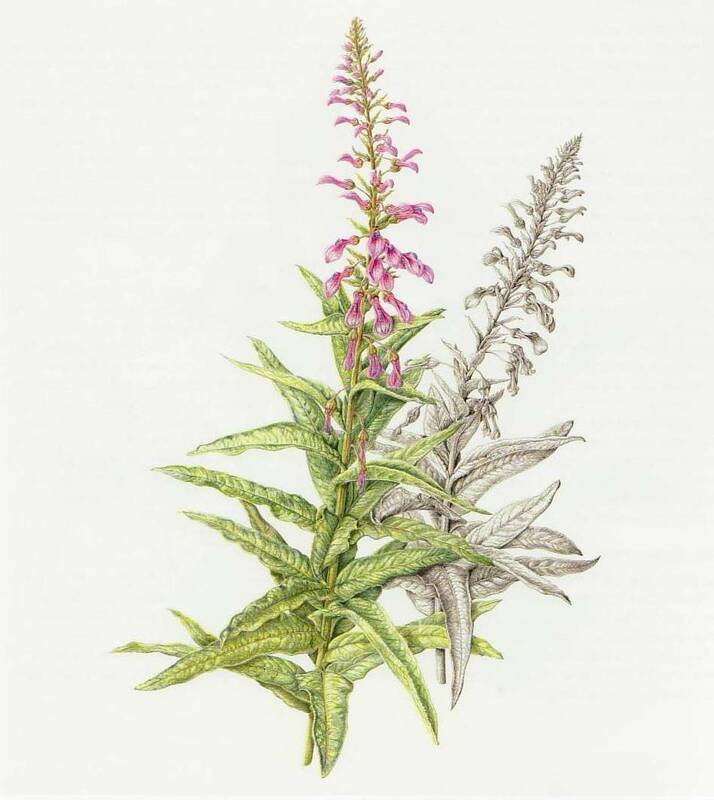 Lobelia bridgesii, called tupa rosada in Chile, is one of the giant lobelias, and it can be found in a tiny range of only about 6 miles. The Universidad Austral de Chile, Valdivia, and the Royal Botanic Garden, Edinburgh, are collaborating on rainforest research and conservation efforts and have established in-captivity propagation programs. In July, 2007, anticipating a trip to Scotland to visit my mother, I learned from the Royal Botanic Garden Edinburgh’s website that they have an extensive collection of very threatened plants from Chile. I contacted their conservation department and discussed my interest in finding a plant to illustrate for this exhibition. I was able to arrange a day at the Garden. Lobelia was prolific, growing up to 5’ tall in a walled garden. I was able to spend the entire day doing preliminary sketches of the plant and taking notes. Along with photographs that I took, I had all the necessary information to complete the illustration in Denver.